Non-invasive, causes no inflammation and requires no special post treatment procedures. Proven to be effective for cosmetic purposes diminishing the visible appearance of fine lines, wrinkles, and acne. Promotes natural production of collagen and elastin. Reduces appearance of aging spots, sun damage. 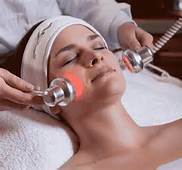 A Photo-rejuvenation light therapy facial is a skin treatment method using specific wavelengths of natural red and infrared light energy to restore skin’s normal activity. The red and infrared light stimulates the human skin at the cellular level to increase the cellular level of activity. This, in turn, stimulates the body to build new capillaries and improve the lymphatic system, which are both essential to creating improved skin. The result is a younger, healthier looking skin. Are there any adverse effects from this treatment? No. This treatment has no adverse effects and is completely safe. It is a FDA approved therapy. Is the Light Therapy process abrasive or painful? How does it feel? A light Therapy treatment is a gentle, painless, safe, non-invasive and non-abrasive treatment. You will find it relaxing and easy. A trained skin care specialist will follow a step-by-step treatment technique with specific lights covering skin areas to be treated. You will experience a feeling of relaxation, light warmth and wellbeing. What is the length of time for the treatment? The treatment itself takes about15-30 minutes. It requires make-up removal and your skin care specialist may add specialized products. This may add to the actual service time. Number of sessions depends on age, skin condition, purpose of the treatment. 6 weekly sessions are recommended for skin rejuvenation. Sun damage and age spots conditions may require up to 20 sessions. Will all treatments take 30 minutes? No. After the original series, localized treatments of 15 to 30 minutes can be administered as part of any professional skin care treatment. Your skin care specialist will explain the appropriate use for your individual needs. Yes. Maintenance treatments are important in order to maintain your visible results. Usually, a once a month treatment is recommended, unless otherwise determined by your skin care specialist. How soon can I expect to see noticeable results? The skin looks different after the first treatment: smoother and more hydrated with a natural radiant glow. Does the skin feel different? Because the results commence from within the skin, the skin feels active, plump, smoother, and tighter. Is the Photo-rejuvenation system a good compliment to other skin care treatments? Yes. As other skin care treatments beautify the skin’s surface, the Light Therapy treatment strengthens and rejuvenates tissue from within. Together, these treatments can deliver remarkable inner and outer results. Is the Photo-Rejuvenation treatment for everyone? While almost everyone can benefit from the use of light therapy, these treatments will have the greatest impact on skin with sluggish metabolism and slow cellular activity showing visible aging signs. Individuals taking steroid or cortisone injections, who are pregnant, or have epilepsy, should not use Light Therapy. To enjoy lasting and cumulative results, maintenance treatments and an effective home skin care regimen are very important determining factors. Can I put my makeup back on immediately? Can I go out in the sun and will this treatment remove my tan? Can I undergo Acne treatment with Retin-A or Accutane while using Light Therapy? Yes, Light Therapy has a calming effect on the skin and will not react with Acne treatments. Can I undergo microdermabrasion while treating with Light Therapy? Yes, Light Therapy will actually calm the after effects of abrasion or chemical peels. How much LED Light Therapy cost?